Your cornea is the clear, round dome of tissue that covers the front of your eye. One corneal condition, keratoconus, occurs when the tissues of the cornea break down. This condition results in the cornea changing shape, becoming a pointed cone shape. Blurry vision is the only symptom, but your doctor may note corneal changes during an examination. Treatment may include contact lenses or surgery, but you may also explore the role of your diet in helping corneal changes. 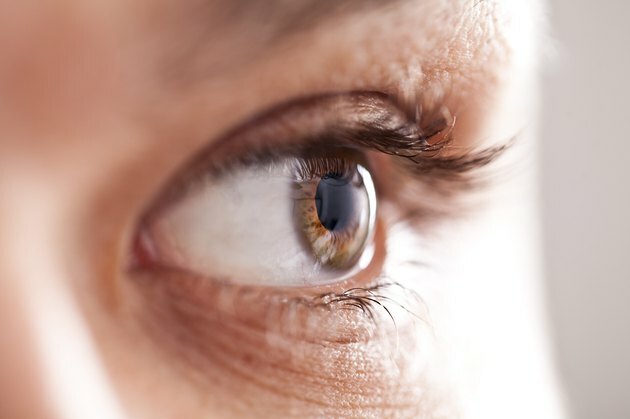 Doctors cannot always determine the exact reason a person has keratoconus, but some cases may stem from genetic conditions that affect the structure of the cornea. Hormones may also have a role in keratoconus since doctors often detect the condition during puberty. Eye rubbing and improperly fitted contact lenses could also play a part in breaking down the corneal tissues, leading to keratoconus. Oxidative stress could destroy the cells that make up the cornea, resulting in the condition. Nutrients in your diet will not help keratoconus caused by hormones, genetics or eye rubbing, but foods that contain antioxidants could help reduce the rate of cell damage caused by oxidative stress. Antioxidant nutrients include beta carotene, selenium, lutein, vitamin E and vitamin C.
If your doctor thinks diet could help reduce the rate of tissue destruction she will help you formulate a dietary plan that includes antioxidants. Sources of beta carotene include carrots, spinach and papaya. Brazil nuts contain a significant amount of selenium, as do eggs and tuna. Lutein-rich foods include spinach, kale and yellow corn, and for vitamin E, select from a variety of nuts and seeds, such as sunflower seeds and almonds. Foods with vitamin C include oranges, spinach, apples and bananas. Dietary adjustments will not cure or treat keratoconus, and you should follow your doctor's recommendations for treatment. Do not rely on your diet to treat your condition, or make extreme changes to your diet without first consulting with your doctor. She can evaluate your plans to ensure that you will have an adequate intake of all nutrients to maintain the health of your entire body. Your doctor may also recommend that you take a supplement that contains antioxidants to make sure you have the right intake each day. National Keratoconus Foundation: What Causes Keratoconus?